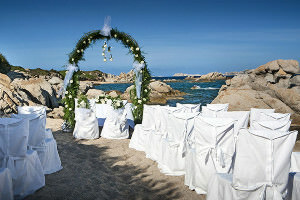 Weddings and Anniversaries, the Delphina package dedicated to couples and honeymoons and Sardinia. Spend your honeymoon in Sardinia or celebrate your wedding anniversary in unique places just a few short steps from heavenly beaches. Choose from exclusive 4 and 5 star hotels by the sea in the North of the island. Delphina has chosen the best sensations for you and your partner. Choose one of 7 destinations from Delphina and get ready to enjoy exclusive experiences just for you: wellness circuits amidst foaming heated sea water pools, massages together, candlelight dinners, mini cruises on deserted islands … let yourself be tempted by the Wedding and Anniversaries offers! The Hotel Capo d’Orso in Palau is the perfect destination for couples looking for privacy, peace and quiet and all the facilities of a 5 star hotel. A romantic refuge with golf, SPA and a private marina so you can discover the paradises of sea and sand along the Costa Smeralda. An unforgettable honeymoon or wedding anniversary. The Resort Valle dell’Erica in Santa Teresa Gallura is a 5 star oasis from where you can enjoy the sea and Sardinia’s genuine unspoilt nature in complete freedom. Perfect for dream honeymoons or for couples with children wanting to celebrate a wedding anniversary and taking advantage of a range of services dedicated to the youngest guests. 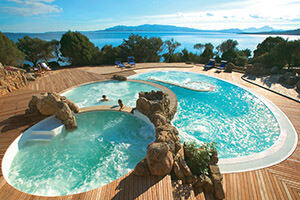 The Hotel Marinedda Thalasso & SPA a Isola Rossa, is the 5 star corner of paradise where every couple yearns to be. Terraces from which to enjoy the fiery red sunsets, enchanting beaches and rooms with private Thalasso pools make every honeymoon and wedding anniversary special and unique. Relaxation and romanticism are the hallmarks of this 4 star hotel on the Costa Rossa. An elegant little jewel with Thalasso centre just a few short steps from Isola Rossa. The seawater pool with its view over the Golfo dell’Asinara and facing little bays with their emerald colour water and wooden solariums will guarantee you wonderful sensations. The 8 kilometres of beach in front of the 4 star Le Dune resort in Badesi together with all the services and facilities on offer will be enough to satisfy the desire to have fun and relax for couples on honeymoon or celebrating a wedding anniversary together with children. A prestigious 4 star village that everyone will agree on. The Park Hotel Cala di Lepre is a 4 star hotel in Palau which is ideal for couples looking for free time activities, wellness and the sea. A honeymoon full of activities and relaxation, facing the La Maddalena Archipelago and the Costa Smeralda so you can set off and discover the most beautiful beaches in the North of Sardinia. The 4 star Resort Cala di Falco in Cannigione at the entrance to the Costa Smeralda is the perfect destination for couples wanting to discover the best locations in the North of Sardinia for a jet-set honeymoon without sacrificing comfort and romanticism.